HPC KAESER has introduced its new ASK Series, said to be compact and refined, but with significantly more power than comparable products, the company reports its new generation ASK Series Rotary Screw Compressors made their market debut in the spring. The company says these innovative compressors not only deliver more compressed air with more savings, but also impress with their user-and-service-friendly design. 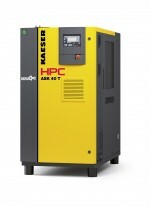 HPC Kaeser says its ASK rotary screw compressors are true leaders in their class when it comes to stationary compressed air applications and also that thanks to further refined Sigma Profile airends, an innovative cooling concept and high-efficiency IE3 motors, these cutting-edge air compressors can perform up to 20% better than many comparable products on the market. ASK models are available for free air deliveries from 0.79 to 4.65 m3/min (27.9 to 164 c/m).